All Things Dog Blog All Things Dog Blog: Toy Joy and Fetching Fun! Toy Joy and Fetching Fun! Puppies need playtime to burn off their excess energy. Without these activities they tend to get into more mischief and cause more trouble. We walk or bike most every morning, and afternoons include sporadic times for training, play and swimming. Tanner's favorite game is fetch; fetch in the pool is double fun. Even Fetch training is a good disciplinary tool, and one which many dogs enjoy. Your dog doesn't have to be a "retriever" to enjoy playing fetch. Teaching your dog to fetch and return a toy to you has many distinct steps, each a skill in its own. Perhaps I'll save that for another post, but suffice it to say, that learning to Fetch is excellent mental and physical activity for an energetic dog to find focus with. Pick a toy which your dog is enthusiastic about playing with, and which is suitable for a fetch game. It must have enough weight that you will be able to throw it a fair distance. Dog must master a brief "Sit, Stay". Give verbal praise. Owner throws the toy and with eye contact, gives the "fetch" command. Dog runs to get the toy. 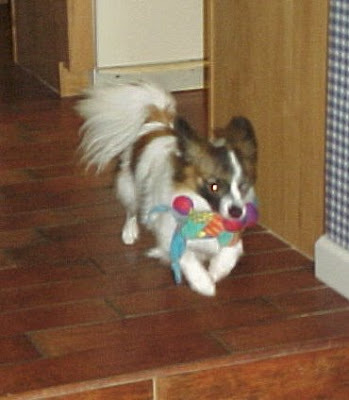 If he runs toward the toy, give verbal praise and encouragement. If he picks up the toy, get even more boisterous with your praise. Goal is to get the dog to return the toy and drop it at owners feet. Praise and a treat are earned when this occurs. "Leave it" command asks dog to stay until you give fetch command, even after toy is thrown. Multiple toys can be learned by name and thrown. Dog is asked to fetch the correct toy by name. This game is lots of fun when your dog has an audience. He gets a chance to show off; He knows the names of his toys! I'll bring you another post with more detail later. If you want to get started now, write to me at LetsAdoptaDogPark@gmail.com and I'll help you out.